"When companies focus on culture, the positive effects ripple outward, benefiting not just employees but customers and profits. Read this smart, engaging book if you want a practical guide to getting those results for your organization." "Most books on customer service and experience ask leaders to focus on the customer first. Shane turns this notion on its head and makes a compelling case why leaders need to make 'satisfied employees' the priority." "This is a must read for anyone in a customer service-centric industry. Shane explains the path to creating both satisfied customers and satisfied employees." The question is not, "does your company have a culture?" The question is, "does your company have a culture that fosters outstanding customer experiences, limits employee turnover, and ensures high performance?" Every executive and manager has a responsibility to positively influence their workplace culture. 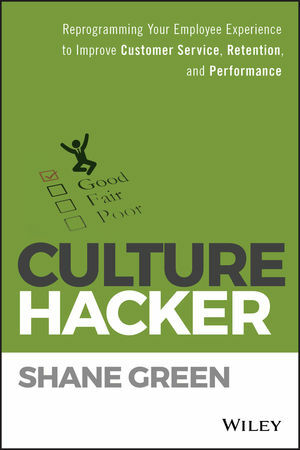 Culture Hacker gives you the tools and insights to do it with simplicity and style. SHANE GREEN is a world-renowned keynote speaker, author, television personality, and consultant to global Fortune 500 leaders on customer experience and organizational culture. Shane draws on his foundation at The Ritz-Carlton Hotel Company and his work in multiple industries, to help clients transform customer experiences by improving employee habits and mindsets. As president and founder of SGEi, Shane leads a team of professionals who inspire iconic brands, like the NBA, Westfield, Foot Locker, Net Jets Inc., W Hotels, and BMW to reprogram their employee experiencesin order to create loyal customers and raving fans.